STEAM stands for Science, Technology, Engineering, The Arts and Math. Art is not just visual art, but encompasses all the arts like Dance, Music and learning about all mediums of art! STEAM curriculum encourages children to learn and discover the world around them by observing, experimenting, questioning and investigating. At Trinity, we want to encourage your children to ask the questions, predict the outcomes, and explore the world around them through fun and exciting hands-on activities. Science activities include exploring nature and learning about animals and plants, comparing differences in natural materials like sticks, pinecones etc. and looking using a magnifying glass to see leaves and bugs close up! Technology is not just about computers, but also calculators, videos of children engaging in dramatic play, recording children’s voices so they can hear them the way others hear them. Taking pictures of children’s art and activities. Engineering is in block area. 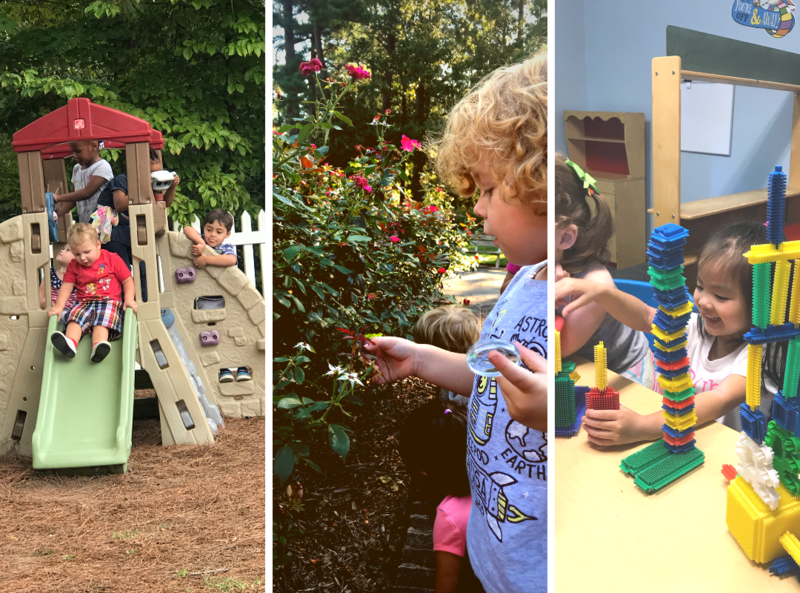 Preschool build towers and buildings and use their imagination. Other materials used in engineering: toothpicks, rocks, boxes, cups and the list goes on! There is no end to what materials and designs we can create. The Arts are not just about coloring or painting. It’s process art, using different mediums, learning about famous artists, dancers and actors! Math includes counting, patterns, matching and measuring too! It’s not just about numbers!